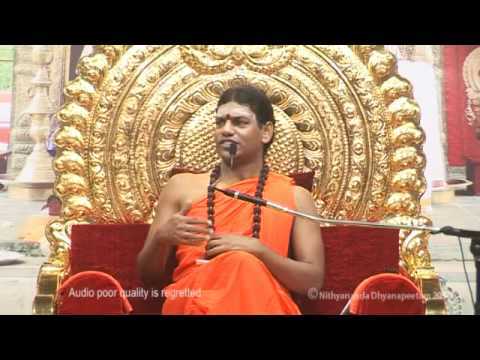 Paramahamsa Nithyananda continued with his teachings outlining how samskaras (engraved memories or engrams), our emotional and mental scars, affect how we behave in the present. Some of us even carry physical scars which are related to samskaras carried in past lives and these engrams are responsible for all brain disorders such as Alzeimers. Scientist Joseph Chilton says Samskaras or engrams are fixed predispositions carried in our subtle body that warp the neutral flow of energy and deliver pseudo (false) information to the brain, resulting in disturbance in the neutral processing of information the brain is designed to provide us! The best solution, says Paramahamsa Nithyananda, is to make sure humans develop individual awareness before the age of 14. This is the only way an evolved human civilization will happen. Until then, all we have is hell, everyone suffering from running into other people's samskaras. No healthy relationship is possible in an environment such as this. Paramahamsa Nithyananda remembers during his seeking, asking the question, "Who am I?" He said the answer was so unfathomable, he dropped it. He narrates his experience in his life with an enlightened master who created a situation in his life which taught him, 'Whenever you break the ordinary and become the extra ordinary it is to tell you that even the ordinary is not worth holding.' Dr.Timothy McCall says the brain is pliable and capable of developing new neurons, neural pathways, and memories as you create new habits and life patterns, even in adults. By using Cathartic Meditation Techniques and intense physical exercise, these engrams and samskaras can be permanently erased from your body, and a newer, healthier version of you can be born.